(Newser) – A Philly high school senior is describing his prom as "epic," which is probably still an understatement considering what his mom forked out for it. WTXF reports that Saudia Shuler had originally wanted to send son Johnny Eden Jr. to Dubai as a graduation gift, but serious health problems on her end (including a cancer diagnosis and a stroke) put those plans on hold—so instead she spent $25,000 to lend a Dubai feel to his big prom night. That over-the-top UAE ambience included Johnny's three dates, who accompanied him to the prom in a succession of luxury vehicles (a Lamborghini, a Range Rover, and a Rolls, to be exact), multiple stylist-assisted outfits, and a pre-prom block party complete with 3 tons of sand and … a camel, rented from an Ohio farm, per Billy Penn. 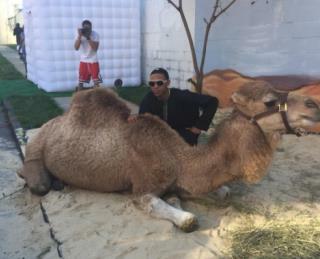 One camel but with his dates, ... 3 humps !! Must be a woman of means if she could afford to spend that much with all the health issues she's having. Hope it all works out for them both. ok, i'm confused. it said he had three dates, so wouldn't that mean three camels? anyhow hope he had a good time before he straps on the suicide vest.